Thinking about attending TINC? That's great, let us help your case! Below we have outlined several helpful ideas for communicating to your management team the critical nature of attending this invaluable conference. TINC is nothing like other conferences that are sales-centric in design and intent. TINC is the Industry’s Turnaround Network meeting where all company turnaround networks come to meet and share knowledge every year (while obeying a strict code of conduct to ensure confidentiality and compliance with antitrust laws). Immediately following the conference, many companies meet on their own to organize their takeaways, set their own company’s goals, "sharpen their saw", and recharge their knowledge. TINC will have a session that provides actual benchmarks of where your turnaround practices stack up against other companies (results will be blinded). Such quantification is not available at any other conference. Expand your personal skill set and knowledge base, and add immediate value to your organization by learning established best practices and new strategies from experts and peers. These practices and strategies are based on real-world testimony and case studies. Unlike other conferences that seem to be passive and non-participatory, TINC is an actual working session, requiring the knowledge and engagement of attendees. This is not a vendor sponsored activity that is light on content, information, and takeaways. Discover the latest AP-Networks solutions through product demonstrations, case studies, and best practice tracks. 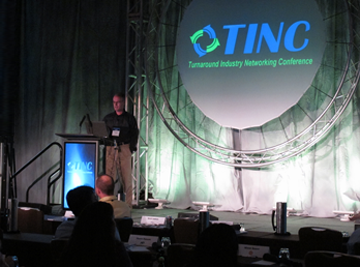 TINC is an opportunity to spend two days among dedicated turnaround professionals from all over the world. We invite you to take advantage of the opportunity to learn from each other, as well as build new relationships and contacts within the industry. Present an internal training session highlighting what you've learned at the conference to your colleagues. All collected presentations from the conference will be made available for you to share with your co-workers. Apply what you've learned at TINC to make a difference. Information you gain here - from productivity enhancements to cost savings, could easily justify your attendance and others at next year’s TINC!